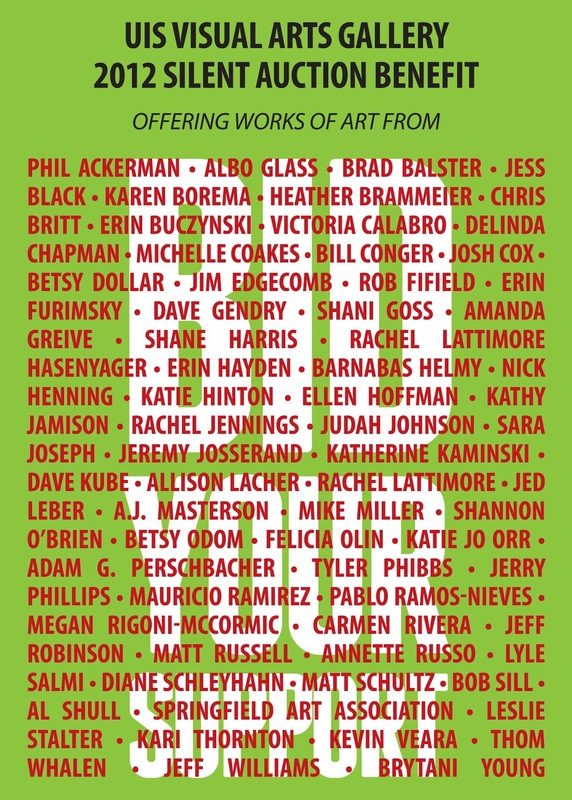 The University of Illinois Springfield Visual Arts Gallery will hold its annual Silent Auction Benefit December 10-13, 2012. This year, the auction boasts a wide range of high caliber works by artists from Springfield and throughout Illinois. A closing reception, along with final bidding, will take place on December 13 from 5:30-7 p.m. in the Visual Arts Gallery. This annual fundraising event will feature an extraordinary range of work by artists who are celebrated locally and nationally. Local artists Chris Britt, Mike Miller, Felicia Olin, Thom Whalen, Kevin Veara, and Betsy Dollar are among the list of local artist donors. The list goes on to include Bloomington artists Erin Furimsky and Rob Fifield, Peoria artists Bill Conger and Heather Brammeier, Decatur artists Lyle Salmi and Annette Russo, Chicago-based artist Nick Henning and Betsy Odom, and also Brooklyn-based artist Victoria Calabro. These are but a sampling of artists represented at the auction this year. The Silent Auction Benefit will launch bidding at the UIS Visual Arts Gallery on Monday, December 10, and bidding will remain open through Thursday, December 13. The Thursday reception, from 5:30 to 7 p.m., will include complimentary refreshments as well as offer final bidding for auction items. Enjoy festive holiday music performed by the UIS Chorus from 5:30-6 p.m. and the Chamber Ensemble from 6:10 to 6:40 p.m. This event is free and open to the public.